Tune in to Afternoon New Music at 3:00 PM today to hear an exclusive interview with Steve Swell in anticipation of the performance of Steve Swell Quintet: Kende Dreams at Vision Festival on Thursday June 9th, 9:30 PM. This will be the first of a series of interviews WKCR will be airing in anticipation of the Vision Festival happening next week, June 7-12. The interview features new music from Steve Swell taken from the new Steve Swell Quintet LP, "Lone Travelers" and a discussion of his upcoming gig at Vision Festival. Join us to hear Steve Swell talk about his music, Bartok, free jazz, Kende Dreams and most importantly the Vision Festival. 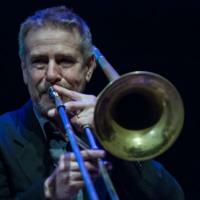 Steve Swell is a free jazz trombone player and a very important member of New York City's free jazz community. He has performed with Anthony Braxton, Cecil Taylor, William Parker, John Zorn, Elliot Sharp and many more.